Lionel Messi believes Barcelona have taken a "small step" towards winning the treble after dispatching Manchester United in the Champions League quarter-finals. Messi scored twice in a 3-0 win at Camp Nou on Tuesday that secured a 4-0 aggregate victory over Ole Gunnar Solskjaer's United. "As I said, I'm happy for the win," he told Movistar. "We've taken a small step [towards the treble]. We have to think about LaLiga and try to be champions as soon as possible. "We'll prepare for the semi-final in the way the match deserves." 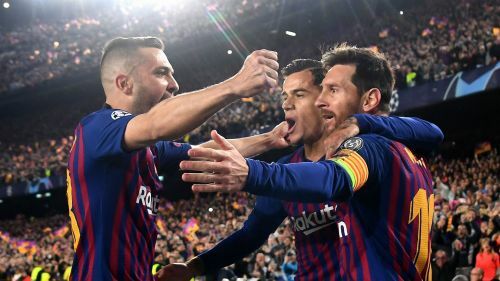 Barca's win came as Juventus were stunned by Ajax in Turin, the Eredivisie side claiming a 2-1 victory on Tuesday and a 3-2 triumph on aggregate. "It tells you everything," he said of the Juve defeat. "They're the best. It's going to be tough. "We have the experience of Roma [a 3-0 defeat last season] - any match can make going through difficult, any opponent is going to be very difficult."